When is the last time you watched a sunset? On vacation? Yesterday? Many years ago? No matter your answer, there is no doubt watching a sunset is the perfect time to dream and reflect. The Sunset Dream mesh bag is a whimsical blend of cotton candy pink fading into periwinkle shades of blue. The magical sunset is highlighted with flamingos and palm trees gracing the foreground for the perfect glimpse of paradise. Now you may not always have idle time to watch the sunset, but you can revisit the beauty with the Sunset Dream mesh gear bag. 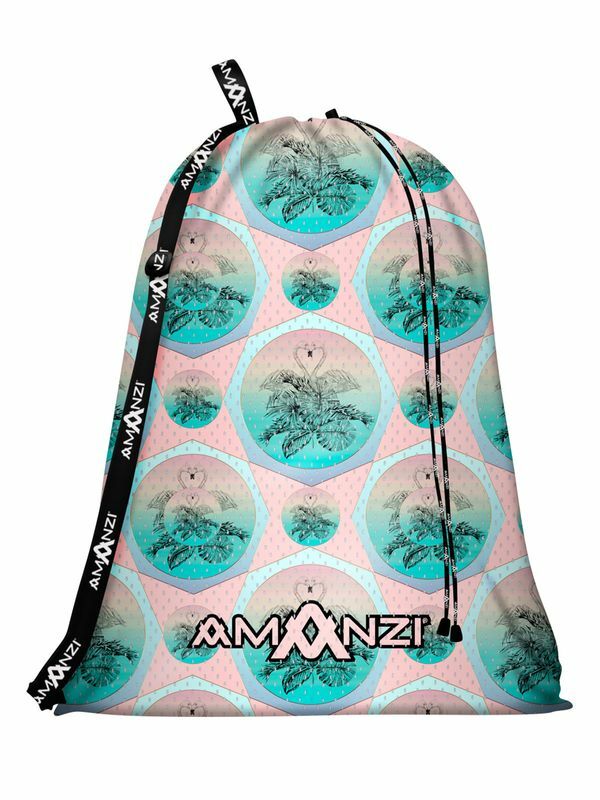 The Sunset Dream Mesh Bag has been designed by AMANZI Swimwear. AMANZI (a-marn-zee) meaning water in Zulu, is an Australia sports swimwear company specialising in chlorine resistant training swimwear for competitive and active swimmers. AMANZI was created to satify the needs of the fashion forward athlete with designs that are functional and highly durable. The team at AMANZI Swimwear understand that swimwear is not just something you swim in, it should also be a reflection of your unique style and personality. AMANZI puts a great deal of effort into their prints so that you can feel comfortable in your swimsuit and look great!